Need a completely unique and wild gift to blow someone away? 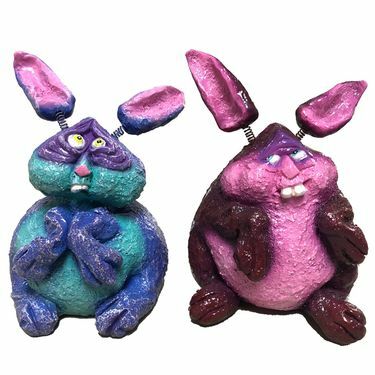 Direct from the super natural 5th dimension, these ridiculous Geeky Bunnies have come to town and are anxiously waiting to enter your home and garden! From the loving and wondrous mind of acclaimed artist Steven Lee Smeltzer, these outrageously unique and inquisitive bunnies are Out-of-this-World! Bursting with hypnotizing colors and crazy personality, each statue statue stands 5" tall and has wandering ears that will keep you entertained! Comes lacquer coated for additional durability and long lasting shine. You'll love the fine details in these Smeltzer statues including their hand-sculpted cast resin faces. An incredible gift for anyone with a good sense of humor and appreciation for incredibly humorous statuary - especially of the extremely unique kind! Display them as a garden statuary accents or as indoor pieces of art. Talk about a conversation piece - keep the pair, or give them as gifts! Hand sculpted garden statues with popping colors. Special lacquer coating protects colors and shine.